BSE Sensex closed higher by 416.27 points, or 1.19%, to 35,322.38, while the Nifty 50 rose 121.80 points, or 1.15%, to close at 10,736.15. However, BSE MidCap and SmallCap fell 0.24% and 0.57%, respectively.Among the sectoral indices on BSE, bankex gained most at 1.91%, finance 1.71%, oil and gas 1.17%, and energy 0.80%, while consumer durables fell 0.97%, realty 0.85%, capital goods 0.63% and industrials 0.58%. On NSE, Nifty Bank rose 2.39%.In the Sensex kitty, Adani Ports, HDFC Bank, IndusInd Bank and Mahindra were top gainers, whereas Sun Pharma, Tata Motors, Hero MotoCorp and Dr. Reddy’s Labs were among the major losers. The Indian rupee weakened marginally against the US dollar on Thursday as traders awaits gross domestic product (GDP) and fiscal deficit data due later in the day.At 2.06pm, the rupee was trading at 67.51 against the US dollar, down 0.11% from its previous close of 67.44. The currency opened at 67.43 a dollar and touched a high and a low of 67.32 and 67.60 respectively. The 10-year bond yield stood at 7.834% from its Wednesday’s close of 7.782%. Mahindra and Mahindra Ltd said that it has signed two memoranda of understanding with the Government of Maharashtra to further its next phase of expansion in electric vehicles. Shares gained 2.72% to Rs919.95. BSE Sensex traded higher by 196.13 points, or 0.56%, to 35,102.24, while the Nifty 50 rose 57.10 points, or 0.54%, to 10,671.45. However, BSE MidCap and SmallCap declined 0.24% and 0.38%, respectively.Among the sectoral indices on BSE, oil and gas gained most at 0.89%, IT 0.81%, finance 0.78% and teck 0.61%, while power declined 0.70%, healthcare 0.51%, basic materials 0.35% and realty 0.33%. HDFC Bank, ONGC, M&M and Hindustan Unilever were top gainers, whereas Tata Motors, Sun Pharma, Power Grid and Hero MotoCorp were among the major losers. Shares of State-owned Oil and Natural Gas Corp. Ltd (ONGC) gained 3.5% on Thursday after the company reported its highest profit in 17 quarters on back of higher oil prices.Fourth-quarter net profit jumped 37% to Rs5,915.12 crore compared to a profit of Rs4,340.18 crore in the same period last year, the company said in a statement on Wednesday. BSE Sensex traded higher by 147.73 points, or 0.42%, to 35,053.84, while the Nifty 50 rose 43.30 points, or 0.41%, to 10,657.65. Orient Cement Ltd shares jumped 10.70% to Rs134 after the company said that it has terminated agreements signed with Jaiprakash Associates Ltd related to the acquisition of Bhilai Jaypee Cement Ltd and Nigrie cement grinding unit. GMR Infrastructure Ltd on Thursday reported a standalone net loss of Rs819.53 crore for the quarter ended 31 March, compared to a loss of Rs2,478.78 crore a year ago. Total revenue in the quarter stood at Rs321.29 crore, up from to Rs272.47 crore in the year-ago period, GMR Infrastructure said in a regulatory filing. GMR Infra shares traded 2.74% lower at Rs17.75 apiece. 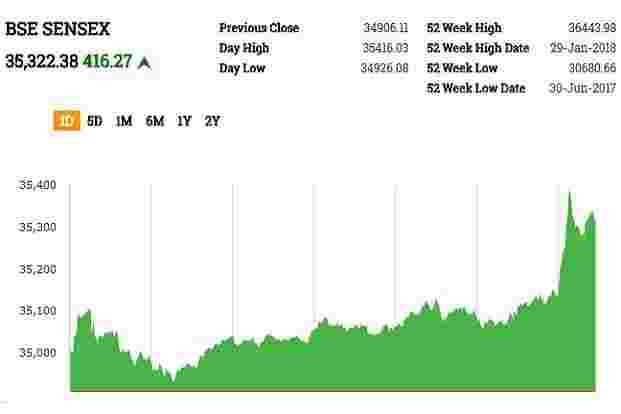 BSE Sensex traded higher by 97.51 points, or 0.28%, to 35,003, while the Nifty 50 rose 26.20 points, or 0.25%, to 10,640.55. Among the sectoral indices on BSE, telecom, energy, consumer durables and oil and gas gained, while power, auto, basic materials and industrials declined.BSE MidCap was flat, while SmallCap fell 0.07%. ONGC, HDFC Bank, Coal India and Infosys were top gainers, whereas Sun Pharma, ICICI Bank, Hero MotoCorp and Dr. Reddy’s Labs were among the major losers. Atlanta Ltd shares dived 20% to Rs51.10 after the company said in a notice to BSE that its statutory auditor PWC resigned with immediate effect. ICICI Bank Ltd shares fell 1.2% to Rs 281.70 after the bank said it will institute a fresh enquiry into an alleged nexus between the husband of chief executive Chanda Kochhar and Videocon Group chairman Venugopal Dhoot over a loan extended by the bank to the conglomerate. Coal India shares gained 4% to Rs298 after brokerage firms CLSA and Glodman Sachs have upgraded the stock. CLSA has upgraded the stock to buy from outperform and increased its target price to Rs360 a share from Rs335. Goldman Sachs upgraded the recommendation on the company to neutral from sell. HDFC Bank Ltd shares surged 3.6% to Rs2,120 as window for foreign investors in the bank will open on 1 June. Analyst sees buying more than $1 billion from foreign investors. The bank’s ADRs, rallied 7% at 12:20pm in New York, set for the biggest jump since January 2015. Reliance Communications Ltd (RCom) shares soared 15% to Rs20.10 after NCLAT on Wednesday stayed the corporate insolvency resolution process initiated against RCom and two group companies—Reliance Infratel and Reliance Telecom. The NCLAT order came after telecom equipment manufacturer Ericsson India Pvt. Ltd, which had initiated the insolvency proceedings, accepted RCom’s offer to pay Rs550 crore by 30 September. BSE Sensex traded higher by 151.67 points, or 0.43%, to 35,057.78, while the Nifty 50 rose 58 points, or 0.55%, to 10,672.35. The Indian rupee opened marginally higher against US dollar as traders awaits gross domestic product (GDP) and fiscal deficit data due later on Thursday.The rupee was trading at 67.37 against the US dollar, up 0.09% from its previous close of 67.44. The currency opened at 67.43 a dollar. The 10-year bond yield stood at 7.821% from its Wednesday’s close of 7.782%. Bond yields and prices move in opposite directions.